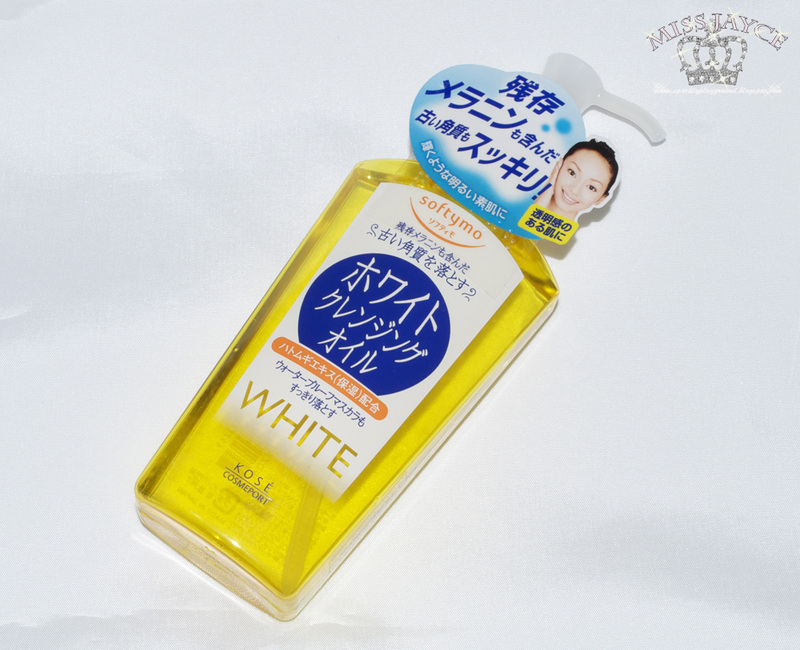 Kose Softymo White Cleansing Oil is an oil type make-up remover that can remove old keratins and make-up quickly. The Orange Oil and Rice Bran Oil help to emboss the heavy make-up like stubborn water-proof mascara, and remove all your make-up. This cleansing oil contains Job's tears ingredient to keep moisture in your skin, so you will not feel a stiff or dry skin after using. Start with dry hands (no water), pump 1-2 for light make up days and 2-3 for heavy make up days. Spread gently and thoroughly over dry face. For me, I spend more time and massage my eye area due to heavy primers and waterproof mascaras. Many people like to add a few drops of lukewarm water to face to emulsify but I like it purely oil. I feel like if I added water, the consistency isnt strong enough. When you're done removing all make up with the cleansing oil, rinse thoroughly with lukewarm water. I like to use a sponge to help rinse/clean it off. This way I can visually see all the make up that's being washed off. If I have heavy make up that day, I usually like to double cleanse my face even though the first round removed most of it. After that, I continue with the rest of the cleansing and skincare routine. My bf got this for me when he visited Hong Kong last year. see haul here. You can get this at Asian markets, drugstores, Sasa, Bonjour, Colourmix, eBay and Amazon. The prices online ranges from $5-12 USD. I love love love cleansing oils so I decided to try a Japanese drugstore brand this time around. This is the most affordable (cheap) cleansing oil I've bought so far and the result is amazing! It's perfect for my dehydrated (dry/combo) skin and it's gentle enough to use daily. My mom has oil/combination skin and it did not break her out either. This product did not clog our pores. It does a marvelous job at cleaning away dirt and make up. It can clean away all my stubborn BB cream and waterproof mascaras off with ease. Literally, every little trace of makeup is removed yet leaving no oily or sticky residue after wash. (Make sure to use luke warm water though!!) My skin feels clean, soft, smooth and not stripped by the oil. I would say that the cleaning power is about par with the Shu Uemura and Fancl's cleansing oils. The texture of the oil is not thick. It is slightly lighter than Fancl's cleansing oil but not runny. It is good enough to do its job to spread and massage to clean. I actually like that the texture is not too thick because I can use less product to spread. Sometimes, I noticed that with thick cleansing oils, I tend to pump more to make it easier to spread all over my face. Some other points I noticed with the cleansing oil is that there's a tint of citrus scent. It's not extremely noticeable and its not bothersome either. I'm not entirely sure about the whitening effect it promises. I haven't seen any significant changes, if any at all, actually. The cleansing oil also does not sting my eyes where I remember 2 years ago, Biore's cleansing oil literally KILLED my eyes. So I'm happy that this KOSE one didn't. However, when the oil did get into my eyes, I must say, I hate that my vision gets blurred for a while. I usually rinse it off with a lot of water. This is only thing I hate about cleansing oils. Product: 5/5 ♥ Fits with description perfectly! Price: 5/5 ♥ When compared to Fancl, Shu Uemura, Bobbi Brown, this is beyond affordable! It's SO CHEAP! !